I have a favorite picture of my grandmother, Florence. 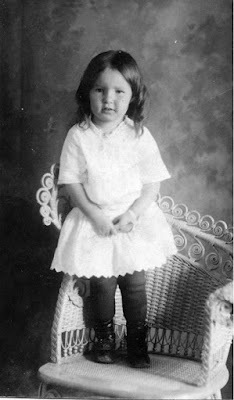 In the picture, a little girl with serious dark eyes and loose brown curls perches on a wrought iron chair. She looks slightly unsure, but not frightened, with perhaps the hint of a smile. Those same eyes, searching yet steady, show in photos of Florence as a teenager and a woman. Here, they gaze out over the chubby cheeks of a five-year old. She clasps her hands lightly on the skirt of her white embroidery dress, a matching ribbon tied in a bow around her left wrist. She loved that dress, although looking back as an adult she thought the heavy black play shoes and dark stockings made for a hideous picture. Virgil loved the Sunday curls in her hair. Even moreso, he adored his half sister. Everyone loved Florence, from Virgil--home from college and about to get married--on down to the toddler, Woodrow. 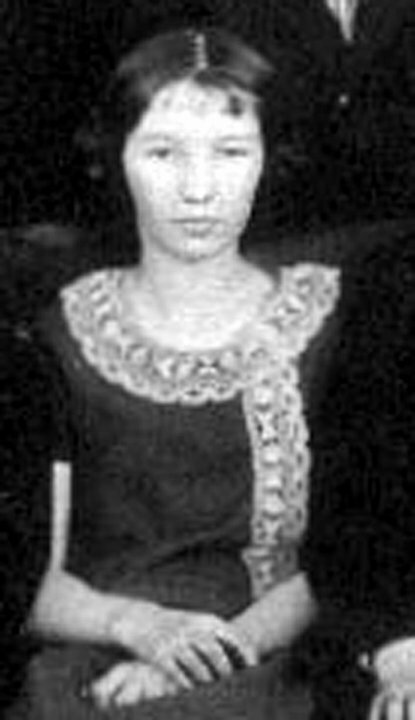 Perhaps Florence, with her winning combination of determination and sweetness, reminded the family of all that was still good in a world gone wrong. With World War I in full swing, and brothers Virgil and Alvin waiting to be called up, even the sheltered Southern Utah town of Parowan needed the innocence of a cherub in white embroidery and black stockings. And so Virgil whisked Florence to the town photographer to capture the beauty of Sunday curls and dainty dresses. Never mind the clunky shoes. Parowan finally boasted a town photographer, and children grew up all too soon in those days. Florence herself met the world in short order. Three years passed in the warmth of summer rides on the hay wagon, evenings spent listening to Mamma (Harriet) reading poetry, and family singalongs at the organ. Then came what Florence later referred to, rather euphemistically, as "the Delta adventure." Father (Mahonri) sold their beautiful home and uprooted the family to Delta to seek their fortune. The business venture failed, and before the year was out, they returned to Parowan, penniless. Delta claimed not only the family's pride but also the life of baby brother Homer. His death dealt a blow to Harriet's already frail health. Diagnosed with pulmonary tuberculosis while still in Delta, she willed her way through another eight years, finally dying in the middle of Florence's sophomore year of high school. The oldest child at home by this time, Florence shouldered much of the burden of those last years with her mother and essentially raised her younger brothers after Harriet's death. The loss of her mother and the heaviness of the years after Delta left its mark on Florence and all of the children. But the warmth of those dark eyes prevailed. Inheriting her father's tenacity and her mother's grace, infused with her own remarkable compassion and capacity for joy, Florence never quite lost sight of the little girl in white with the steady gaze. If this is any indication of what that biography is going to be, I cannot wait to read it. So, get it written already, will ya? Beautiful recollection, Juliana. I love her picture! I do hope you included this passage in your book! Best of luck with your literary adventure.